Dennis Maurice Drisker, 51, of Battle Creek, passed away Saturday, November 17, 2018 peacefully at home. 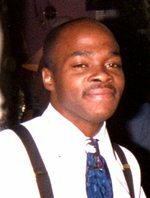 He was born July 10, 1967 in Battle Creek, the son of Lewis W. Drisker, Sr. and Pearlie M. (Maddox) Shepard. He attended Battle Creek Public Schools and graduated from Battle Creek Central, class of 1986. Dennis worked for the Battle Creek Public School system in maintenance for 5 plus years. He accepted Jesus as his personal Savior and was baptized December 31, 2012 at New Birth Bible Church, where he was a member. Dennis loved to dance and was always the life of the party. He enjoyed playing cards, dominoes, going to the casino, scratch off lottery tickets, and fishing. He was always playing jokes and making people laugh. He loved his family fiercely and most importantly the time they spent together. He is survived by his mother, Pearlie; children, Dennis, Brandon and Tyree Tatum; siblings, Phyllis Drisker, Lewis Drisker, Jr., Timothy Drisker, and Lori Brown; step-sister, Renee Shepard; special brother, Keith Wright; grandchildren, Anayia, Brandon, Jr., BrayShawn, Aaliyah, Aaveyah, Tyree, Jr. and one granddaughter on the way; and a host of nieces, nephews, and friends. He was preceded in death by his father Lewis, Sr.; step-father, Andrew Shepard; siblings, Gregory Maddox and Monica Maddox; granddaughter, Amayia; grandparents, Joshua (Olivia) Maddox, Sr.; and uncles, Joshua Maddox, Jr., and Arnold Maddox. Visitation will be held Monday, November 26th from 11:00 AM to 1:00 PM at Bachman Hebble Funeral Service with a committal service at Oak Hill Cemetery to follow at 1:45 PM. Burial will be at the Oak Hill Cemetery in Battle Creek, MI.